Together with the Stuttgart-based design studio Phoenix Design and Schunk, Fraunhofer IPA has been working on the completion of its new service robots for three years. The result is unique. 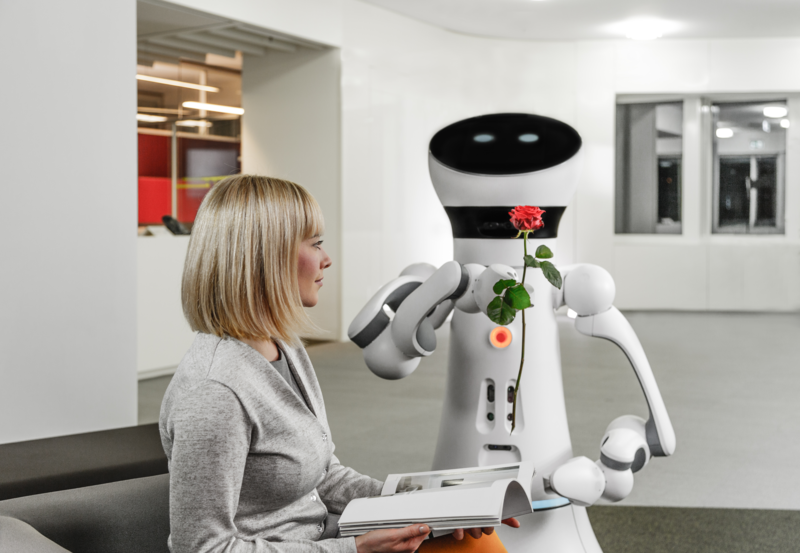 “The fourth generation of the Care-O-bot® is not only more agile, modular and charming than its predecessors, but it also stands out through the use of costreducing construction principles,” explains Dr Ulrich Reiser, Project and Group Leader at Fraunhofer IPA. In this way, large parts of its internal construction feature folding sheet metal, which is economical to produce in small quantities. Andreas Haug, co-Founder and Managing Director of Phoenix Design, adds: “Care-Obot® 4 is a successful symbiosis of design and engineering, as well as functionality and emotion, which quickly encourages user interaction.” Its streamlined design, with two arms attached at the side and a type of head, mean that the robot is reminiscent of a human being. However, developers did not want its appearance to be over-human, as this would “encourage false expectations with regard to its capabilities” for users, says Ulrich Reiser. It is just the robot’s “internal values” which are human: it always maintains a respectful distance, shows what it has understood and what it intends to do, while also being able to make simple gestures and reflect emotions. As with previous generations, social role models were used as a guiding vision in developing the design and functionality. While the concept for the Care-O-bot® 3 was a more reserved, cautious butler, its successor is as courteous, friendly and affable as a gentleman. Care-O-bot® 4 offers open software interfaces that makes it easily expandable for deve- lopers. Ulrich Reiser is keen for as many scientists as possible to use the system developed in Stuttgart in order to steadily advance its possible areas of application. “The objective is to steadily grow the developer community that was established already around CareO-bot® 3,” he explains. Numerous developers at research institutions and universities around the world have already worked with the Care-O-bot® 3 and the new Care-Obot® 4 should follow suit. The Fraunhofer Institute for Manufacturing Engineering and Automation IPA was founded in 1959. It is one of the largest single institutes within this research organization and employs around 435 scientists. It has an annual budget of approximately 58,4 million euros, of which 22.9 million euros derive from industrial projects. The Fraunhofer IPA is made up of 14 individual departments engaged in the fields of Production Organization, Surface Engineering, Automation, and Process Technology. Its research and development work focuses on organizational and technological issues in the manufacturing environment of advanced industries, including Automotive, Mechanical Engineering, Electronics and Microsystems Engineering, Energy, and Medical and Biological Engineering. The R&D projects aim to enhance production processes and make products more cost-effective and environmentally friendly by identifying and exploiting the potential for automation and streamlining at our customers’ companies. This helps to maintain jobs and to strengthen international competitiveness. Dieser Eintrag wurde veröffentlicht in Development, English, General, Hardware und verschlagwortet mit Care-o-bot, Fraunhofer, Robot von Sebastian Trella. Permanenter Link zum Eintrag.